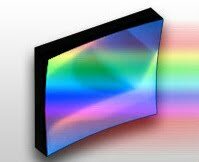 GratingWorks specializes in the design and fabrication of original holographic diffraction gratings and various spectral modules. Our grating products include LPDL, planar, aberration-corrected concave/convex, and Rowland Circle designs. Our engineers have strong design capabilities in diffraction optics, spectrographs and related optical, mechanical and electronic systems. Holographic gratings from GratingWorks have a groove density from 40 to 6000 lines/mm and cover a wavelength range from 0.1um to 10um. Fringe profiles can be sinusoidal, deformed sinusoidal, or triangular. GratingWorks' quality management system is ISO 9001:2000 certified. The Quality management applies in the areas of Design, Fabrication and service of Holographic Gratings and Spectral Modules. When you click "Send Request", we will send the contact details you supply to GratingWorks USA so they may respond to your inquiry directly.